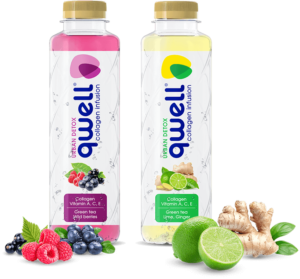 Introducing the new members of the qwell family – Urban Detox Collagen Infusions! The new qwell Urban Detox line: Collagen infusions that are developed for those who live an urban life style and are exposed to pollution, oxidative stress, toxins and other harmful effects of the environment. Qwell Urban Detox is an innovative and unique combination of premium hydrolyzed collagen, the finest Alpine water from the Daggio spring in Italy, antioxidant vitamins A, C & E, green tea extract and apple pectin. They come in two flavours – Wild berries and Lime&Ginger. Important for proper detoxification is to rev up the metabolism. For this protein is the key! Also, water is an excellent way to detoxify. Sufficient hydration means a quicker and healthier detox, proper food processing and digestion, better kidney functions and better excretion, improved metabolism, better collagen synthesis, more beauty, shine, better shape, energy and overall improved health. The hydrolyzed collagen in qwell accelerates its absorption and its synthesis. Natural mineral water – the finest Alpine water from the Daggio spring, Introbio (LC) in Northtern Italy – нthe highest natural spring in Europe, located at 1935 meters above sea level. It has a strong antioxidant effect, improves the immune system, vision, skin, teeth, bones, mucous membranes of the internal organs, reduces the harmful effects of electromagnetic and radioactive radiation. Supports the collagen synthesis. This antioxidant protects brain cells from being destroyed while stimulating their work. It increases production of interferon and provides immune protection. As a cell membrane level antioxidant, it promotes anti-aging, increases the immune forces of the body and improves oxygen absorption. Strong antioxidant. 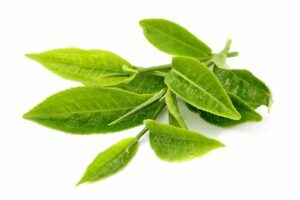 Green tea flavones and catechins protect the body from free radicals. Accelerates metabolism, has anti-viral and anti-cancer activity. Regulates potassium-sodium equilibrium. Promotes fat-burning. Increases energy in the body, thus affecting the thermogenesis. A natural inhibitor of ACE which reduces blood pressure. Stimulates T cells and improves immunity. It improves and enhances metabolism and has a pronounced detoxifying effect and quickly removes toxins from the body. It has a beneficial influence on the digestive processes. It lowers cholesterol levels, reduces blood pressure, acts as a suppressant, helps to lose weight. Citric acid is involved in metabolic processes and has a detoxifying effect. 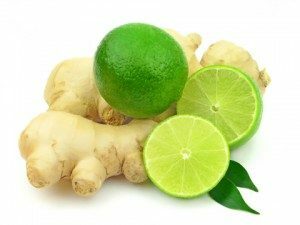 The lime helps the digestive tract and has fat-burning effect. It has a strong anti-inflammatory and antioxidant effect, slows the aging process. Reduces muscle pain after workout. 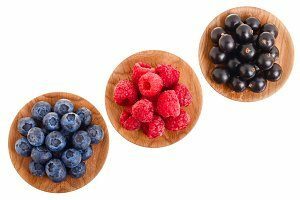 Blueberries reduce abdominal fat, improve brain functions and the entire nervous system by preventing neuronal degeneration, thus improving memory and visual acuity. It improves the metabolism, promotes weight loss, improves vision, slows down aging, increases immunity. Both Urban Detox flavours are made with premium quality ingredients, all flavours and extracts are natural and precisely chosen to make you feel good inside out!